For quality and portability, choose the Compact Mass Kit. 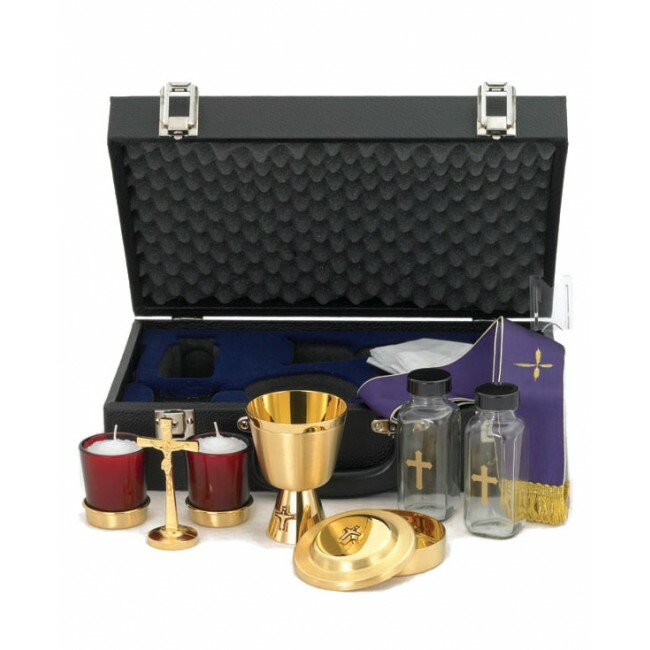 The scaled-down design includes all of the essentials for performing Mass away from the church, including a chalice, votives, a crucifix, a pyx, cruets, a reversible stole and a white finger linen. The components of the kit are finished with beautiful gold plating and polished to a high shine. The pieces are contained within the hard-sided case, which is lined with ABS foam to absorb any bumps or drops while traveling. The foam is lightweight and noted for its exceptional protective qualities. A built-in handle provides an easy grip, making it easy to carry the case to any site, whether indoors or out. Though small in size, this Compact Mass Kit should not be underestimated. It is easy to use and contains all of the pieces of larger kits, only in a smaller scale.